A modified Russianballistic missile launched at 10:21 a.m. EDT (1421 GMT) today carrying aEuropean probe that will measure the tug of Earth's gravity with finer detailthan ever before. The $450million European satellite launched a day later than planned due toproblems retracting the pad gantry. The Gravity field andsteady-state Ocean Circulation Explorer, or GOCE, launched atopa Rockot launcher at Complex 133 at the Plesetsk Cosmodrome in farnorthern Russia. The Rockotis an SS-19 missile built to deliver nuclear warheads to targets across theglobe. 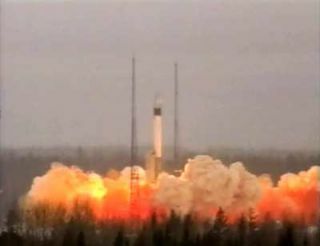 Eurockot, a Germany-based launch servicesfirm, oversaw Tuesday's launch for the European Space Agency. GOCE?s launch was postponedfrom September after rocket officials discovered a failure in the guidanceand navigation system of the Rockot's Breeze KM upperstage. Technicians had to replace the rocket's gyroscope and refurbish itspower system, delaying launch to this year. Controllers will monitorthe GOCE from the European Space Operations Center in Darmstadt, Germany. The spacecraft carries anultra-sensitive sensor to detect subtle variations in Earth's gravity field asit circles the planet in an unusually low orbit just 162 miles high.